The Criterion Ultralight 350 review below is taken from the now defuct website ‘Adventures in a Strange World’ (www.ukexploring.co.uk), it was originally posted on 12th May 2013. A screen shot of the article can be viewed here. 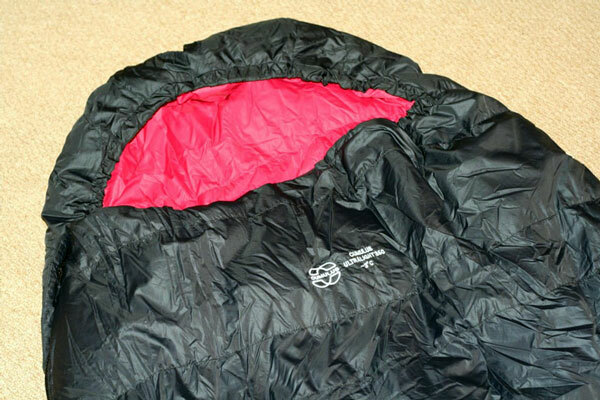 Please note the sleeping bag in this Ultralight 350 review was purchased before our rebranding. The Cumulus Ultralight 350 (now renamed Criterion Ultralight 350) is aimed at the fast and light hiker, mountain racer or kit enthusiast who is looking for a compact, light and warm “3 season” sleeping bag. I don’t care much for season ratings but do appreciate companies which give realistic and sensible comfort ratings. 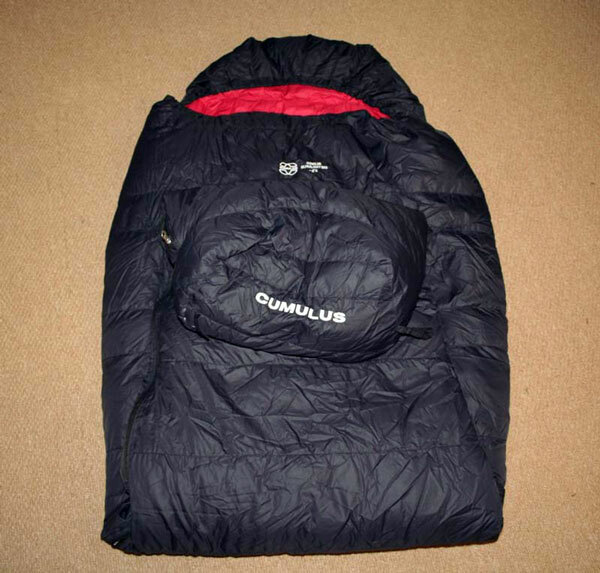 Cumulus gives this sleeping bag a comfort rating of -3C. They must be fairly confident because they stitch this onto the front of the bag. In keeping with the target purchaser Cumulus have carefully selected the features for the Cumulus Ultralight 350 to keep the weight low but strip away anything they consider unnecessary. This stripping away includes having no internal shoulder baffle. The bag does come with a handy internal pocket, full length YKK two-way zip with anti-snagging and a nice thick zip baffle. The hood is a good shape and the foot box is excellent. Cumulus use Trapezoid shaped baffles and a differential fill to give high heat retention while keeping the weight low. Cumulus claim the bag weighs 765g my bag weighs in at 802g. The Cumulus does come with a stuff sack and storage sack. 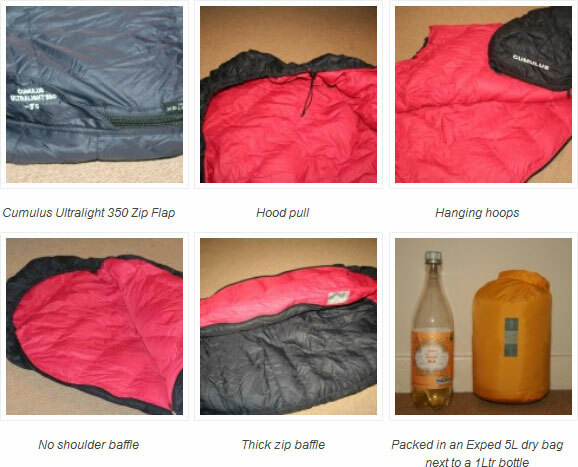 Although the Stuff sack is light at 20g it is only water resistant, I use a small (5L) Exped dry bag when out on the trail. My Cumulus Ultralight 350 and I have been friends now for 2 years. I purchased it from Spike Outdoors (now closed) who gave great advice and service. During the last couple of years I have used the bag in a variety of environments and at various temperature ranges from 20C down to approximately -6C. The Cumulus bag lofts well and it has performed excellently. Warmth is always very subjective, I sleep cold and I will generally sleep in just a thermal base layer set. The Cumulus works well for me down to the claimed -3C, below this I need to wear additional layers. I find the ultralight 350 really comfortable, the chest area has enough space to allow the down to loft without leaving too much space; the Leg section is narrow but not too narrow. Length wise I am 5’11” and I would say this is the bags limit, particularly during cold weather where the lack of a shoulder baffle means you have to clamp down the hood. The bag is made of Pertex Ripstop Microlight with DWR+ treatment, 52 gms/m2. The material is really soft and breathes really well, my only question is – why don’t they make bed sheets out of this stuff? In addition to being so luxurious, It has also stood the test of time and looks as good as new after 2 years regular use. My only reservation about the Cumulus Ultralight 350 is the lack of a shoulder baffle. I understand that I can have the same heat retention by controlling the hood adjustment, but for me, I know I would be more comfortable if I had a shoulder baffle; I guess the question would be, is it worth the extra grams? Overall, I have been very happy with this bag and if you are looking for a very light and reasonably priced sleeping bag the Cumulus Ultralight 350 is an excellent choice.